Millions of voters in the Democratic Republic of Congo went to the polls on Sunday to choose a successor to President Joseph Kabila. The elections come after a series of delays,partly caused by Kabila's initial refusal to step down at the end of his second and final term in December 2016. The two-year postponement of the vote caused a violent political standoff that left dozens dead across the country. Sunday's election will see Congo's 40 million registered voters using electronic voting machines with touch screens for the first time. The innovation has raised concerns among the opposition that the machines could produce a rigged result. The poll pits two main opposition candidates, Martin Fayulu and Felix Tshisekedi, against Kabila's preferred successor, former Interior Minister Emmanuel Ramazani Shadary. Altogether 21 candidates are contending the presidential election, which is taking place at the same time as votes for the national legislature and municipal bodies. Fayulu is a former oil executive, while Tshisekedi leads a long-established opposition party, the UDPS. Opinion polls put Fayulu clearly in the lead on 44 percent, with Tshisekedi on 24 percent and Shadary lagging behind on 18 percent. Fears of election unrest were stoked after a decision was taken at the last minute to bar some 1 million people in the east from voting because of a deadly Ebola outbreak there. Although the election there has only been postponed till March, the delay provoked protests. Legal experts say the move is unconstitutional and will affect the credibility of the election, already undermined by mistrust of Kabila. And on Saturday, the two opposition frontrunners refused to sign a proposed peace pledge designed to avert violence after the election, saying the text needed changes. Analysts say that the chances of post-election violence are high, with between 43 and 63 percent of respondents in opinion polls saying they would reject a victory for Shadary, who was known for hard-line policies as interior minister and is facing EU sanctions over a crackdown on protesters. 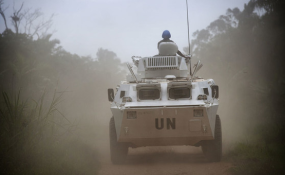 Congo has experienced two wars in the past 22 years and the country remains undeveloped despite its rich resources, including valuable minerals used in smartphones and electric cars.